Excellent source of Iron, Zinc & six B Vitamins for infants. Easy pour spout. Gerber Cereal is an excellent source of Iron. Iron is an essential nutrient for healthy physical growth and mental development. One serving of Gerber Cereal provides baby with 45% of the recommended amount of Iron. McCann’s quick cooking oatmeal is made from the finest quality Irish oats. These oats are specially grown and harvested for McCann’s by local farmers in accordance with a strict quality assurance program. They help in reducing the risk of heart disease and contain no sodium or cholesterol. McCann’s quick cooking Irish oatmeal is the biggest selling line of McCann’s products–you will love the taste of this product with its distinctive texture and flavor. These oats are 100% wholegrain too, so they contain all the combined goodness of the endosperm, bran, and germ. They are steamed and rolled to reduce the preparation time–so you can enjoy a hearty bowl of oatmeal in only two minutes. The quick cooking Irish oatmeal is quite versatile and can be used in cooking and baking. If you are looking for great tasting oats, then go no further than McCann’s Irish oatmeal. This is sold in a pack of six 16-ounce boxes. The story of McCann’s dates back to 1800 when John McCann built a mill at Beamond, on the east coast of Ireland. John McCann’s Irish oatmeal secured many prizes for its excellent quality over the years and the company continued to grow steadily. A piece of McCann’s history was created in August 2005 when for the first time production of the trademark 28-ounce tin of steel cut oats exceeded 1 million tins for a twelve month period. McCann’s has been making the classic oatmeal product for more than 150 years – and it has changed very little in that time–it is still the same real thing. McCann’s is best known for its classic steel cut oats packed in the iconic 28-ounce tin. 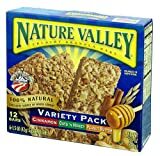 However, there are many other tasty products available–quick cooking oatmeal, instant oatmeal, and oat bran. All McCann’s products are non-GMO. They are specially grown by local farmers–there are no GMO oat crops grown in Ireland. Three delicious, all natural, organic flavors in every pouch: lemon, lime, and orange. Four boxes each with five 0.4Oz packets. Sunny Citrus fruit snacks offer a burst of all-natural lemon, lime, and orange flavors. Certified organic, these bunny-shaped fruit snacks are made with real fruit juice and packed with 100% daily recommended value of Vitamin C.
Imported Swiss. Delicious grains with fruit and crunchy nuts. Switzerland, known for its luscious green pastures, crystal clear lakes and magnificent mountains, is also the birthplace of Muesli. For centuries, Swiss families have been starting their day with this blend of cereal grains mixed with fruit and nuts. For almost 50 year, the Bio-Familia company has offered the original Muesli recipe to the world. From the small town of Sachseln, nestled in rich farmland and surrounded by the Alps, villagers work diligently to produce authentic Muesli, granola and other fine cereals. Today, the Bio-Familia company uses its years of experience to create unique cereals that deliver abundant flavor but very little fat. 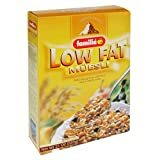 Familia’s Low Fat Granola is a blend of oats, spelt, corn, soy flakes and cereal crispies. These wholesome grains are carefully mixed with raisins, wheat flakes, honey and coconut and then roasted to create a perfect combination of great taste and healthy goodness. Why settle for cereal that tries to look Swiss? Enjoy the best – 100% authentic Granola made in pride in Switzerland! For generations, the Bio-Familia company has been providing the world with authentic Swiss Muesli, Remaining faithful to the nutritional concepts developed by Dr. Bircher-Benner late in the 19th century, Familia cereals are perfect for today’s healthy eating goals. Still produced in the quaint village of Sachseln nestled in the beautiful Swiss countryside, Familia cereals are the result of a passion for quality and healthy goodness. Enjoy it the Swiss way! Make the delicious cereal part of your healthy eating lifestyle. Try adding a chopped apple or any fresh fruit along with milk or yogurt. You’ll get the authentic Swiss feeling and a great start to you day! Packed in a protective environment. UK’s no. 1 tea. Better taste, free flow bag. 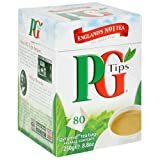 With PG, you’ve not only got a tasty cuppa, but a healthier diet brewing! Caffeine in tea is relatively low, almost half as much caffeine as coffee, and moderate amounts of tea (6 cups/day) do not show adverse effects on the body. What’s more, PG contains antioxidants (called flavonoids). You get them in fruit and vegetables and they’re really good for you. So sit back and enjoy your PG moment! 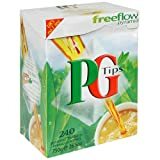 PG Tips, made with plantation fresh tips, is 100% natural. We only use the top two leaves and a bud, known as the tips, for a great tasting cuppa! Made in England. Exchange: 2-1/2 Carbohydrates. The dietary exchanges are based on the Exchange Lists for Meal Planning, Copyright 2003 by The American Diabetes Association, Inc. and The American Dietetic Association. New improved taste. Naturally & artifically flavored. 2 g Net carbs. 190 Calories/serving.